Description Oswego Food Center is your convenient one-stop shopping center for groceries, imported specialties, fruits, vegtables, meats and bakery goods. The prices will please your budget and you'll enjoy shopping in our modern, spacious building. Finest selection of quality foods in the are, and there is always plenty of parking space. Stop in for a snack at our lunch fountain. Open 7 days a week. 109 A Avenue. Phone BL 1-1414. Out of file L.O. 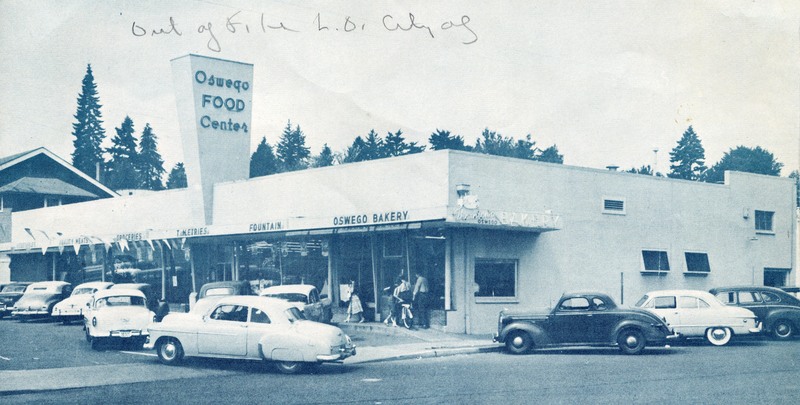 City [on building] meats, groceries, fountain, Oswego Bakery. Physical Description H 5.5"" x W 8.5""